All gardens need water, but what do you do when we get too much of a good thing? 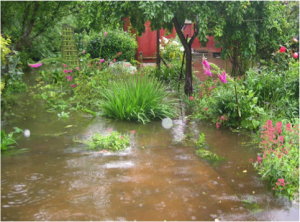 Floods and long-standing water can be devastating to a garden. The damage that is done will depend on the duration of the flood, the types of plants, the type of soil they are growing in and whether there have been any contaminants in the flood water. When plants are subjected to water-logged soils for long periods of time, roots are deprived of essential oxygen. Water fills all of the pore spaces in the soil and roots can begin to suffocate and die. Healthy native trees are fairly well adapted to temporary deluges. They will generally recover with little observable damage. Large shrubs may also bounce back well. Perennials will need to be observed for awhile to see how they fare. Annuals will be the first to show stress, and the least likely to recover. Vegetables and fruits are more susceptible to periods of water-logged soils. Neither appreciates wet feet for any length of time. Herbs are also resentful of wet feet. Many of our favorite herbs originated in the Mediterranean and thrive in drier climates. If your garden has been inundated with city or residential storm water, chances are you will have to deal with contamination issues. Storm water is often contaminated with raw sewage, garden chemicals, and hydrocarbons. If you have visibly contaminated water, such as a sheen of oil on the surface, consult a professional. You will need a professional soil test from a laboratory that can identify the contaminants and help you assess the situation and develop a remediation strategy. All is not lost in this case. Time and good soil biology will deal with sewage exposure. There are natural bio-inoculants that digest hydrocarbons. It will take time, but nature will overcome it. You can actually start with “washing” the garden. Hose down everything to remove mud and surface contaminants. You can follow this with a foliar application of EM-1, which has been shown to expedite the degradation of hydrocarbons and is being explored for remediation in spills. You can also use compost tea. There are studies that show this helps colonize the leaf surfaces with beneficial microbes – a first line of defense against environmental pollutants. Do not harvest and eat vegetables or fruits that are growing in the inundated garden. Washing and boiling may remove bacteria, but it will not remove chemicals or roadway contaminants. Clean up the fallen leaves and any foliage that is rotting. They can harbor harmful fungi and bacteria that could affect recovering plants. Stress from water-logged soil may cause some leaves to yellow and drop off, but the branches are not necessarily dead. New leaf buds will begin to grow in a few days. Wait until you are sure there is actual die-back before you prune. Working wet soil can do long term damage to the structure of the soil itself. Soil particles can become compressed, risking long term compaction and exacerbating drainage issues in the future. This damage is not easily or quickly repaired. Allow the soil to dry out for several days. Then push a hand trowel straight into the soil and rock it back and forth, forming a “V” in the soil. If visible water is in the hole, if there is a “sucking” sound, or if the soil at the sides of the hole looks glossy, it is too wet to work. Wait a few more days and test again. Soil biology is damaged when soils are water-logged for long periods of time. Soil microbes that require oxygen to live may die off and those that survive without oxygen may flourish. These anaerobic microbes cause soggy soil to have that foul, sour odor. This imbalance affects the availability of nutrients for plants. The soil food web, which delivers nutrients to the roots, needs a chance to recover in order to function properly. This can happen relatively quickly if the soil was healthy before the storm. If sufficient organic matter, nutrients and minerals are present, beneficial soil biology will re-establish itself once oxygen is available again. Many seeds will have a tendency to rot in soggy soils. If you must replant quickly in the vegetable garden, boost the soil biology with added compost, dried molasses, and perhaps added mychorrhizae, or just start with fresh Arbor Gate Soil Complete. Heavy rainfall can leach nutrients out of the soil. A light fertilization will replace those nutrients. Don’t overdo it. 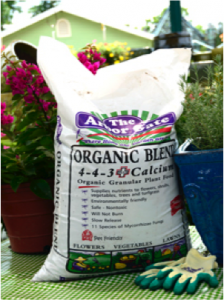 It is better to fertilize lightly several times than to push plants that are recovering from stress. 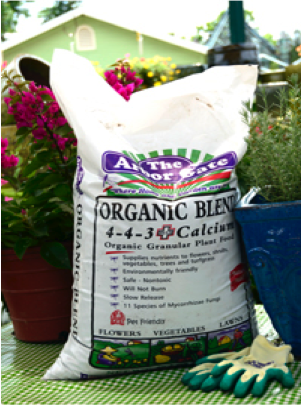 Use only slow-release, organic fertilizers like Arbor Gate Organic Blend to provide micronutrients and minerals in addition to the macro-nutrients, N-P-K.
Foliar feeding with a sea-based product such as Foliar Plus or Liquid Seaweed can quickly boost needed minerals to reduce plant stress. Epsom salts provide the essential nutrients – magnesium and sulfur. In addition to aiding the uptake of other nutrients, these minerals also reduce plant stress. Broadcast at a rate of 1-cup per 100 square feet of bed. Water stress weakens plants. Weakened plants are susceptible to attacks. Fungal diseases are common after periods of heavy rain. Be prepared to take quick action with organic-approved fungicides and pesticides. Pull mulches back from the base of fruit tree, herbs, and vegetables until it dries out. This will decrease the opportunity of fungal disease spores to form and splash back onto the leaves. It also helps the soil dry out faster. Fire ants are likely to raise their nests out of the water-logged soil. Use AntiFuego or the Organic Fire Ant Solution when they are observed. One of the best things you can do after a heavy rain is to assess your landscape. There is no better time to identify problem areas and form a plan to prevent future issues. Get a clipboard and a camera or your cell phone. Walk the garden making notes and taking pictures of places where water stands for longer periods of time. Use this information to help you make future decisions such as raising beds, improving soil texture, and future plant selection. You may decide that you need to seek the advice of a landscape professional if you find that drainage pathways are blocked by landscaping. They can often find ways to resolve these issues without destroying beds you have already established. You may find areas where all that is needed is increased drainage in your soil. Use a permanent material such as expanded shale. 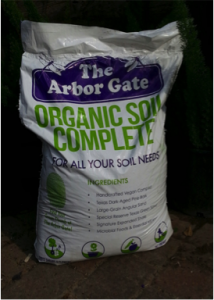 This material increases porosity, which makes a healthier soil as well as improving drainage at soil level. Make a list of plants that seem more sensitive to wet soils. Like it or not, storms and floods are likely in our area. If you have to replace plants, you may want to look for something better adapted to the possibility that it will happen again. 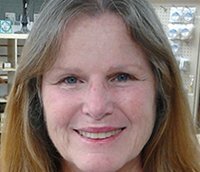 Angela Chandler is a lifelong gardener with a passion for learning and teaching. She tends a ½ acre garden in Highlands, Texas that includes ornamentals, fruits, a small experimental nursery, a flock of Buff Orpington chickens, and a Lab mix named Harley. Her gardening adventures would not be possible without her husband, Fred – always willing to help unload leaves, compost and help build beds. Angela is a member of the Harris County Master Gardener Association – Retired, and a member of the Garden Writer’s Association.